Tropical Cyclone 03S formed in the Southern Indian Ocean and the NOAA-20 satellite passed overhead and captured a visible image of the storm. At 5:12 a.m. EDT (0912 UTC) on Nov.6, the Visible Infrared Imaging Radiometer Suite (VIIRS) instrument aboard the NOAA-20 polar orbiting satellite saw fragmented bands of thunderstorms around Tropical Storm 03S's center of circulation. The VIIRS image revealed that the bulk of clouds and storms were south of the center. The Joint Typhoon Warning Center noted "The bulk of the deep convection remains concentrated southwestward of the low level circulation." On Nov. 6 at 11 a.m. EDT (1500 UTC) 03S's maximum sustained winds were near 35 knots (40 mph/62 mph) making it a tropical storm. It was located approximately 641 nautical miles north of Port Louis, Mauritius near 9.7 south latitude and 58.9 east longitude. 03S was moving west-southwestward and is expected to strengthen over the next several days. NOAA-20 is the first in the JPSS series of satellites. 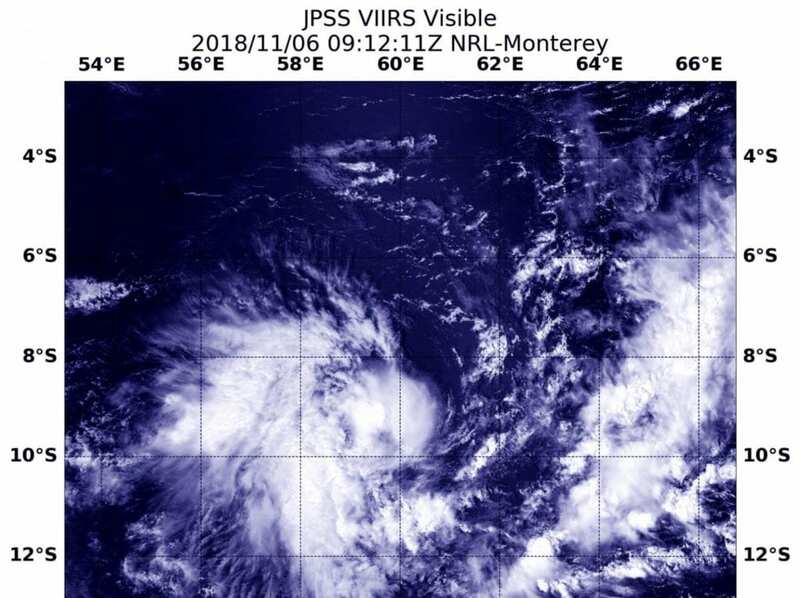 JPSS is a collaborative program between the National Oceanic and Atmospheric Administration (NOAA) and its acquisition agent, the National Aeronautics and Space Administration (NASA). NOAA is responsible for managing and operating the JPSS program, and developing portions of the ground segment, while NASA is responsible for developing and building the JPSS instruments, spacecraft, and portions of the ground segment and providing launch services.